Apart from the corporate and personal benefits arising from risk assessment, employers and the self employed have a legal duty to make suitable and sufficient assessments of the risks to the health and safety of employees, non- employees and the self employed. The Risk Assessment: Principles and Practice programme is designed for anyone with the responsibility to conduct risk assessments. It is particularly useful for managers and supervisors but it will be equally beneficial to individual workers, team leaders, technicians, engineers or any other personal contributing to the risk assessment process. Employers need to ensure that individuals carrying out risk assessments are competent to do so. Competency does not necessarily require particular qualifications but involves a combination of knowledge, experience, skills and personal qualities. Assessors must have an understanding of the workplace and work activities, knowledge of the best practicable means to reduce risks and an ability to make informed judgments. Simply the best days training we have had, the instructors were knowledgeable and experienced in their chosen fields. 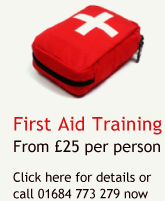 Professionally run, informative and enjoyable training sessions.